Considering Getting a Little Fruity? There’s nothing like a fruit tree in the landscape to delight the eyes and nose with a show of springtime blossoms—and delight the taste buds with summer fruit. That's one of the largest benefits of living on an acreage in Nebraska, there's always plenty of space to grow. While there are many varieties from which to choose, these five fruit trees here will produce bushels of delicious fruit, year after year. A Lapins cherry is one of the largest and juiciest of the sweet cherries, making a Lapins cherry tree a great choice for growing on your Nebraska acreage. In addition, a Lapins tree provides multi-seasonal landscape interest. In April, the tree blooms brilliant white blossoms. 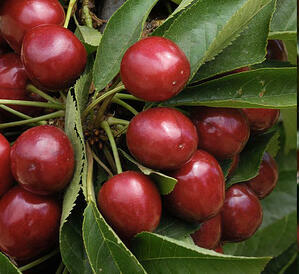 The fruit that follows in July is sweet, large, and dark-red to purple with light red flesh. In the autumn, the Lapins cherry tree will delight yet again with beautiful autumn color as the green leaves turn orange, yellow and red. One of the best parts of this cherry tree is that they do not require a pollinator to set fruit in most regions. The fruits are delicious right off the tree and wonderful for baking, juicing or drying.They grow well in the Omaha, NE growing zone and are hardy enough to withstand temperatures as low as -20° F. Be sure to plant them in a location with full sun and soil that holds moisture without becoming soggy. They will grow up to 20 feet feet high. The Harken peach tree is another self-pollinating tree, which is good news if your acreage is smaller and you need to maximize space. 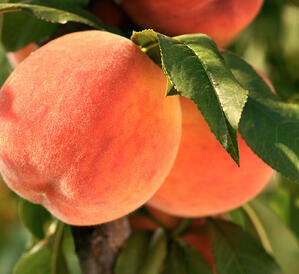 It is best known for its superior quality of mid-season peaches which are great for fresh eating, canning, and baking. But the Harken peach tree is admired almost as much for its beauty and fragrant blossoms as it is for fruit. The delicate peach blossoms appear in late winter or early spring, even before leaves emerge. It is an extremely vigorous tree, growing to a mature size of about 18 feet. So far, this spring has provided the perfect growing environment for its fruit production since it grows best in areas with lots of spring rain. It’s not often you get a fruit that is praised by the likes of Alice Waters, Martha Stewart, and Oprah Winfrey as the most delicious pear in the world. Celebrity testimonials are just one reason the Warren Pear is sought after. 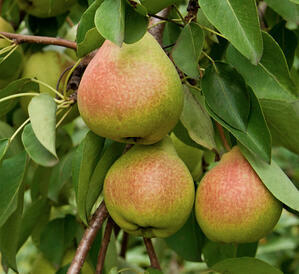 Warren Pear is a semi-dwarf pear tree that brings a late summer harvest of sweet, juicy fruit even in areas where pears are traditionally difficult to grow. 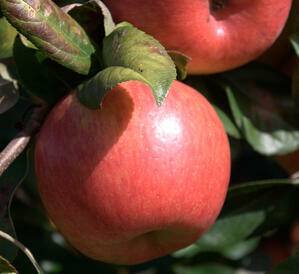 The medium sized, yellow fruit has a lively green tint and an occasional red blush. Since is it also self-pollinating, you won't need a lot of extra room for it. This is quite possibly one of the finest-flavored pears available for home growing and we are blessed that it grows well in the Omaha, NE area. 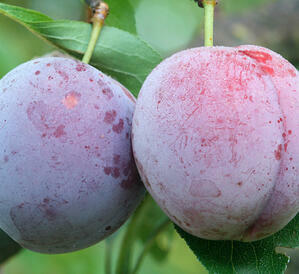 This plum tree is as much a showpiece as it is a provider of food on your acreage home. Plant one in the front yard where your friends and neighbors can share in the beauty of its blooms and the abundance of fruit. Santa Rosa’s flavor is sweet with a slightly tangy edge and it's lovely pink and white blossoms set the stage in springtime with an expected harvest in late July or August. The medium-large, slightly firm plums are perfect for canning, freezing, cooking, drying—or eating right off the tree. The plum trees grow 15-25 feet high and are another self-fruitful tree, so there’s no need to plant another plum tree nearby. If you're looking for more information about the wide variety of fruit trees, shade trees and shrubs available for growing on your Omaha, NE acreage home, visit NatureHills.com.